I can't remember how exactly I came across Corinne's blog. I think I may have met her in the comment section of The Habit of Being's blog. I enjoy Corinne's thoughtful writing and following her lovely Instagram feed. Corinne has been doing an interview series called Creating in the Midst, where she features various women who homeschool but also pursue creativity in some way. 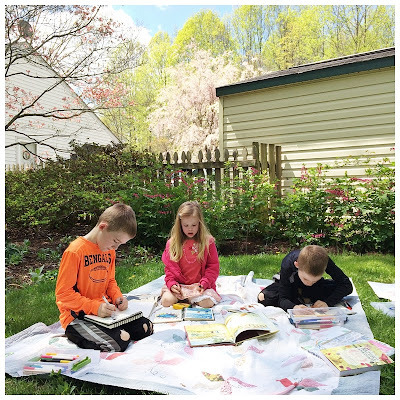 It's been interesting to find out how other homeschool moms seek to find time to be creative themselves in the midst of educating their children. Yesterday, she featured my own thoughts on creating in the midst. Read my thoughts over at Corrine's blog.